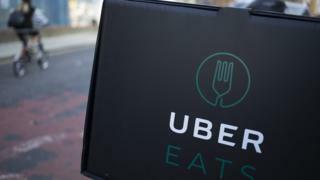 Drivers and couriers for companies like Uber and Deliveroo need full worker rights and not “bogus” self-employment status, MPs have said. Self-employed status leaves workers vulnerable to “exploitation”, the Work and Pensions Committee concluded after an investigation into the issue. And chair Frank Field also criticised Uber’s recent move to introduce a sickness insurance scheme for drivers. Uber said the vast majority of its drivers were happy with their terms. “Almost all taxi and private hire drivers in the UK have been self-employed for decades, and with Uber they have more control over what they do,” a spokesperson said. And they said that licensed drivers who used their app were totally free to choose “if, when and where they drive with no shifts, minimum hours or uniforms”. Last year an employment tribunal ruled that Uber drivers were wrongly classified as self-employed – the company is appealing against the ruling. Deliveroo was also among the companies that gave evidence to the Work and Pensions Committee as part of its inquiry into the so-called gig economy. The firm said in a statement: “We receive 10,000 rider applications every week because people are attracted to the flexible way of working that we offer. “Before Deliveroo existed, many workers in the food delivery business were paid in cash, in the black economy. All of our riders are registered to work legally and pay their taxes in the UK. Jack Clifford says having self-employed status works for him. “As a student in Bristol, Deliveroo offers me the flexibility that I need. I can work one hour in the evenings or a whole day on the weekends, as and when I need the money. “I’m well aware that I don’t have the rights of a worker or employee like unfair dismissal and paid leave, but this is a price I’m willing to pay for a working arrangement that fits my lifestyle perfectly. “This arrangement might not work for everybody, but for the many people who it does work for it is preferable to fixed hours on minimum wage. But, Uber driver Omid says these contracts are nothing short of exploitation. “I have been working for Uber for a while now. The company uses and abuses the drivers. “When you first join Uber, the company gives you a lot of jobs for your first two or three weeks, because you referred new drivers to the company and they try to make you happy. “After three weeks, you sometimes have to wait for two or three hours to get a £2.72 job after the Uber commission. It’s very important that the government intervene on this matter… We have no right to holiday or sickness pay. In the report by the Work and Pensions Committee, chairman Frank Field said companies were “avoiding all their responsibilities” in order to profit from “bogus self-employed designation”. If firms want to class workers as self-employed, they should be made to justify that move, he said. Those changes would protect staff from “the appalling practices that have been reported to the committee in this inquiry”. Mr Field also said that Uber’s recent announcement that driver’s could buy subsidised sickness insurance was “just another way of pushing costs onto the workforce”. In its defence, Uber said it contributed towards the scheme that drivers can join, and which gives a range of benefits including illness and injury cover. Mr Field also said that self-employment caused “substantial” tax losses for the government. Last year the government asked Matthew Taylor, former head of the Labour Policy Unit, to review employment practices. The review will look at security, pay and rights and it will also examine whether there are ways to increase opportunities for carers, people with disabilities and the elderly.